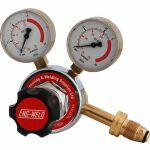 The ENGWELD 300 Bar Multi-Stage regulator provides the ultimate answer to industrial gas pressure requirements. Capable of working on cylinder pressure up to 300 bar, these regulators provide the user with extra safety and precision. The two stage reduction of cylinder pressure within the regulator combines extra safety with precise control over the complete pressure range. The ENGWELD Multi-stage regulator is extremely versatile and can be found in many industries serving a wide range of applications. The regulators are produced under a BS EN ISO 9001 quality management system and the design & construction have been tailored to meet in full the requirements of BS EN ISO 2503.